Welcome to Day #7 of Chocolate and Coffee Theme Week. 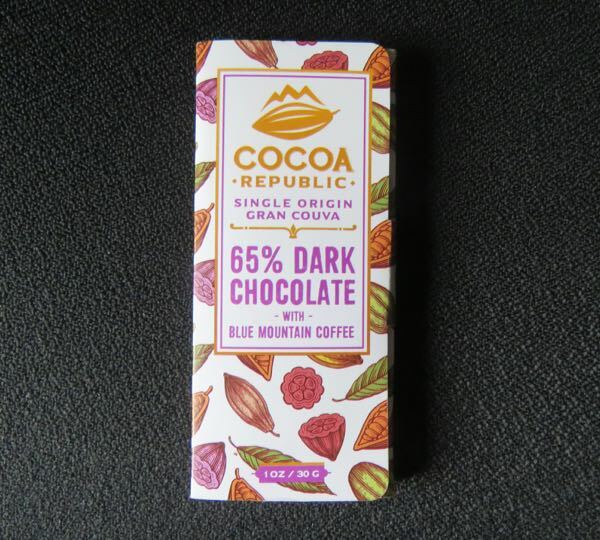 This Single Origin Gran Couva 65% Dark Chocolate with Blue Mountain Coffee (Jamaica) bar was from Cocoa Republic (Diego Martin, Trinidad and Tobago, West Indies). 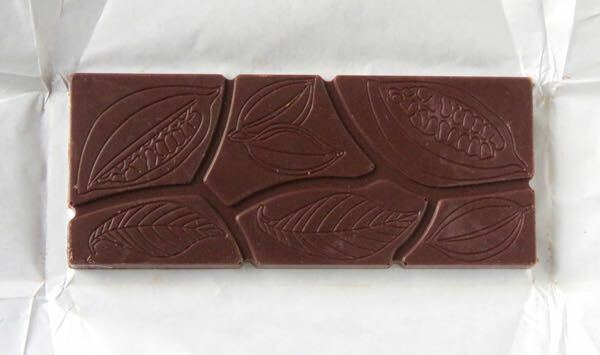 The chocolate makers use only single origin Trinitario* cacao sourced from the Rainforest Alliance Certified, Montserrat Cocoa Farmers Cooperative Society in Trinidad and Tobago. And they make their chocolate "in country." That is, the chocolate is made in the Caribbean island nation of Trinidad and Tobago (off the coast of northeast Venezuela), where the beans are grown, vs. shipping the beans to North America, Europe or elsewhere. The Blue Mountain Coffee in this bar came from Jamaica. 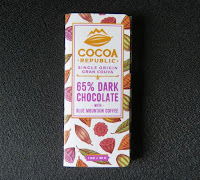 The mindfully-sourced chocolate had a slight spice and cocoa aroma which carried over into the flavor. The coffee flavor was very light. It also had a faint taste of sour milk or mold in the piece that was tasted. 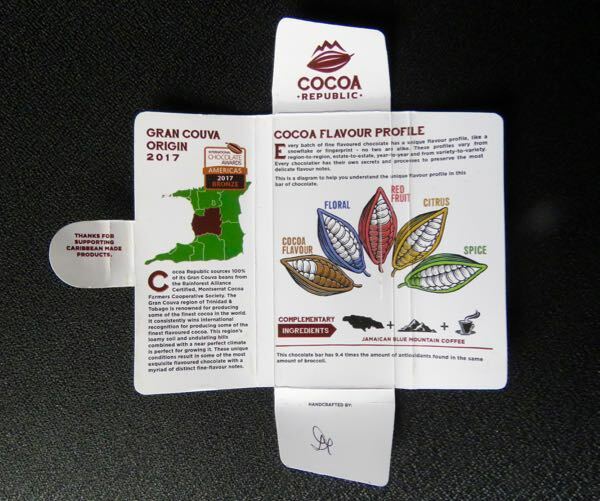 *Cocoa Republic described Trinitario cacao as follows: The Trinitario group represents a hybrid collection of types that arose in Trinidad from crossings between mixed Criollo and mixed Forastero types in the late 18th century. There are currently 11 commercial varieties grown in Trinidad and Tobago. This group took the best qualities from each parent plant, resulting in a healthy, sturdy plant with a robust “chocolate” flavour and a range of subtler secondary notes.